26 miles southeast of Missoula on 1-90 to Beavertail Hill exit, then .25 miles south on county road. 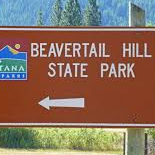 Beavertail Hill includes a half-mile of frontage on the Clark Fork River. Visitors enjoy fishing and camping in the shade provided by a stand of river cottonwoods.